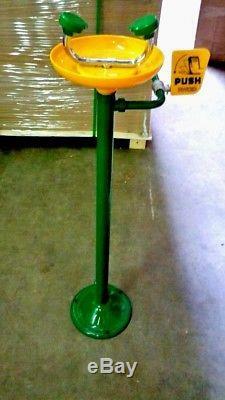 Eye wash floor mount with labels and Installation Kit. 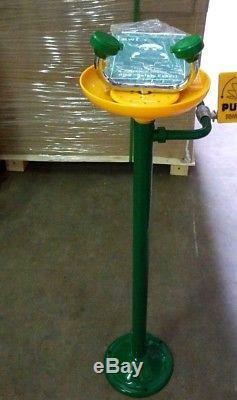 SGPW- SAFETY EYE WASH FLOOR MOUNT. Using ball valve controls eye wash. It is easily operated, open and closed fast, reliable sealing. The spray head: Using the ABS and brass to mould, coming to incorporate, in-built the spumes instrument, having filtration cotton and dust shield, the dust cup can clean the dust usually, removed automatically when eye wash is operate, to debase the hydraulic pressure when to be open abruptly, so as to protect eyes. Main material Both of eye wash bowl and shower sprayer head are ABS, the others is galvanization steel pipeline. The item "Emergency Eyewash, Floor mount" is in sale since Friday, November 3, 2017. This item is in the category "Business & Industrial\Healthcare, Lab & Dental\Medical, Lab & Caregiving Furniture\Other Medical, Lab & Caregiving Furniture". The seller is "dataminisystems" and is located in Houston, Texas. This item can be shipped to United States.